Satisfy Your AQUAMAN craving with "Throne of Atlantis"
At its core, the Aquaman movie is a story about family. That's also a thread that runs through "Throne of Atlantis", as Arthur deals with the legacy of the two worlds that birthed him. Wan's film takes its narrative cue from the comic, with Arthur's origins sticking pretty close to the book. The story the creative team weaved was one that saw Atlanna leave Arthur and Tom Curry on the surface world to protect them from the tyranny of violence of a scorned Atlantis, which is exactly where we find them at the opening of the film. It's not just that dynamic the film shares though, as this storyline really establishes the rivalry between Orm and Arthur. Actors Patrick Wilson and Jason Momoa bring the estranged brothers to life. Two sides of the same coin, they're torn apart by the loss of their mother and the lack of contact with their sibling. In the pages of Johns, Reis, and Pelletier's comic, the pair's relationship is slightly more amicable at the beginning, though Orm's dedication to destroying the surface world soon tears them apart. 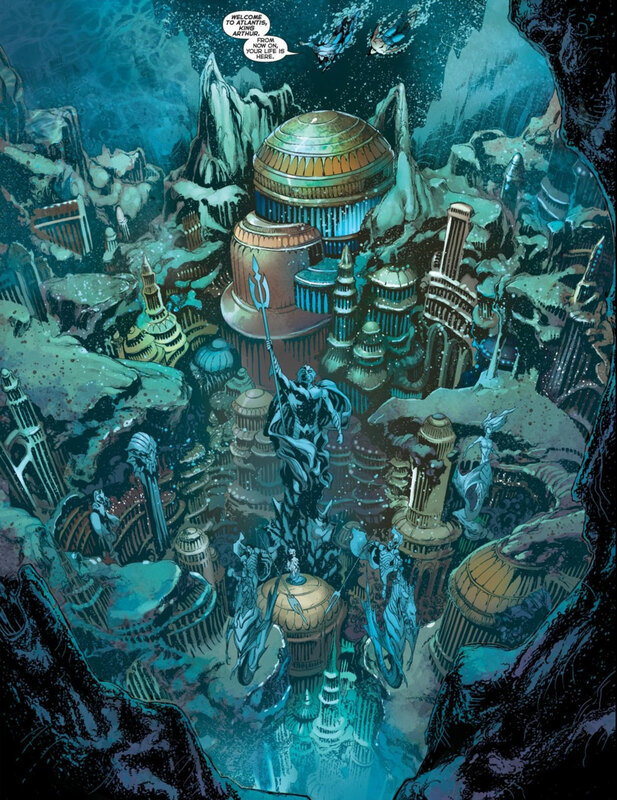 A large part of the comic centers around the Justice League and their intervention, but Wan focuses on Orm, Arthur, Atlanna, Mera, and Vulko, making his tale a truly Atlantean family affair. There are a couple of visual moments which are taken almost directly from Reis and Pelletier's panels, which is always exciting for comic-book fans. One of the most striking action moments brought to life on screen occurs when we see a submarine attack Atlantis, causing devastation and giving Orm a reason to strike at the surface world. As he takes steps to wreak havoc on the land, we see a huge aircraft carrier swept onto the beaches and seafront of Amnesty Bay. Although in the comics the ship is dispatched onto the bustling streets of Gotham, the effect is the same. Though it's only a little moment -- explained in a caption which summarizes the events of the previous issue -- the New 52 run establishes that Black Manta is a treasure hunter. 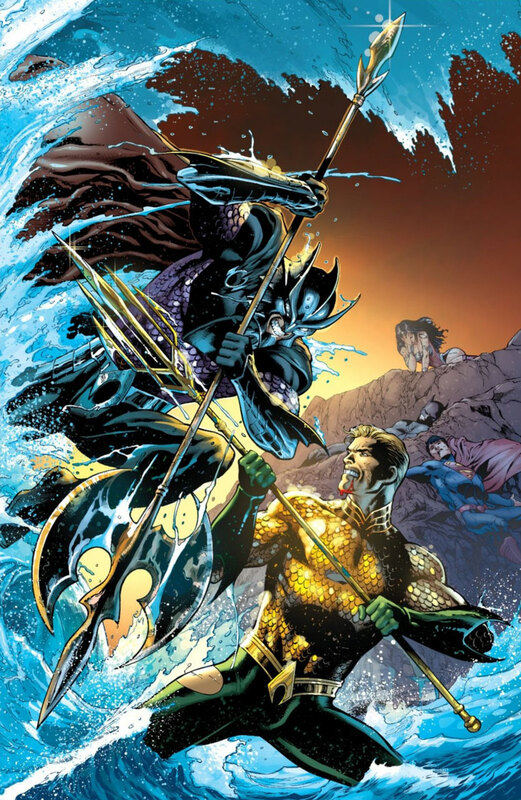 The book also introduces the idea that his chief motivation for hunting Aquaman is he holds the sea king accountable for the murder of his father. Actor Yahya Abdul-Mateen II's portrayal of the pirate is thus closer to the New 52 run than any other version. Before the 2011 relaunch, Manta had a couple of different backstories, neither of which focused on his prowess at finding riches in the ocean or on his father's death. Another featured character in the "Throne of Atlantis" storyline is Aquaman's closest confidant and advisor, Vulko. The film's take on Vulko is that of a mentor to Arthur, the one who trained him and introduced him to the vibrant underwater world his mother hailed from. Johns, Reis, and Pelletier touch on this in the pages of "Throne of Atlantis" -- with a sequence in which the pair dive to the ocean depths and the kingdom of Atlantis. 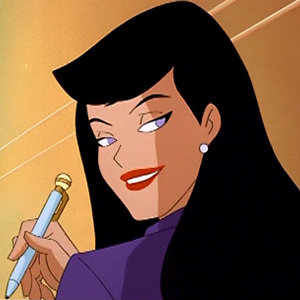 It's a moment we also get to see on screen. Though in the comic, Vulko proves less caring than the man we encounter in Wan's film. A large part of "Throne of Atlantis" is focused on the battle for control of the titular territory. Just like in the movie, Arthur is at first uninterested in taking the throne. But when Orm threatens the surface world, Aquaman starts considering whether or not he should wear the crown. This is one of the driving narratives in Wan's movie, and it's one that's rendered brilliantly in "Throne of Atlantis." The outcome of the battle is the same in both versions. 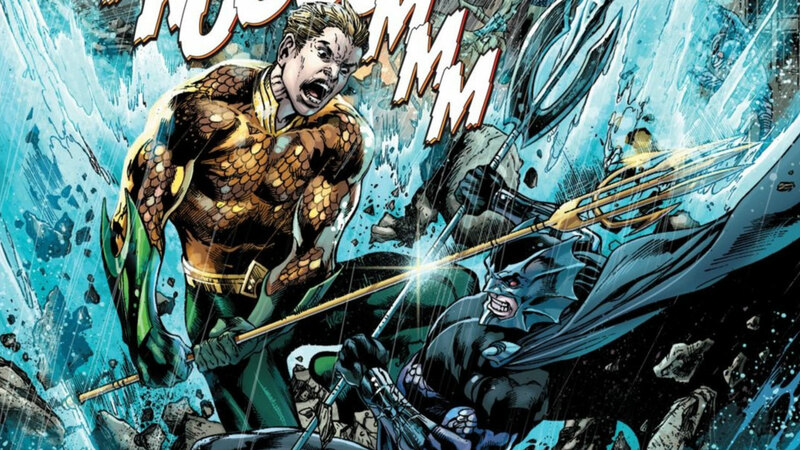 As after Arthur defeats Orm, he takes his place as King of the Seas. You can watch the animated film adaptation of "Throne of Atlantis" right here on DC Universe. And you can go behind the scenes of the blockbuster Aquaman movie in our exclusive DC Spotlight: Aquaman documentary.